Taxonomy: Saron Shrimp belongs to the Kingdom Animalia, Phylum Arthropoda, Class Crustacea, Order Decapoda, Family Hippolytidae, Genus Saron and Species marmoratus. Scientific names: The scientific name of Saron Shrimp is Saron marmoratus. Other common names: Saron Shrimp is also commonly known as Common Marble Shrimp, Long Arms Marbled Shrimp, Monkey Shrimp, and Buffalo Shrimp. Origin or natural range: Saron marmoratus originates in the Indo-Pacific region including Hawaii and Sri Lanka. Size: Saron Shrimp may grow up to a size of around two inches or five centimeters. Color: Saron marmoratus is brown in color during the day time which turns to red at night. Compatibility: Saron Shrimp is non-aggressive towards the other marine aquarium members. In its natural habitat, Saron marmoratus is found in the coral rubble at the bottom of reef or bay or lagoon. Saron Shrimp is nocturnal in habit and therefore, is active during the night. Saron marmoratus molts when it outgrows its exoskeleton. During molting, Saron Shrimp sheds its existing, tight Carapace to replace it with a new, larger one. Saron marmoratus leaves its discarded Carapace at a visible site to dodge its predators, while the shrimp hides away to allow its newly formed exoskeleton to harden. During the day time, the brown body of Saron Shrimp is spotted with green color. The legs have dark brown colored bands or white band on brown colored legs. The body color of Saron marmoratus turns to uniformly red at night. Saron Shrimp has two pairs of long and thin antennae, three body segments and five pairs of legs. The back of the male Saron marmoratus has a bunch of feathery appendages, called Cirri, with long first pair of walking legs. The rostrum of Saron Shrimp is quite large and long and its tail is humped. The head of Saron marmoratus is connected to its thorax and the thorax has an exoskeleton, called Carapace. The antennae serve as a visionary tool for Saron Shrimp. The structure of Saron marmoratus' abdomen is designed in a way to facilitate quick movement. Water flow in the aquarium: Saron Shrimp needs low water current in the reef tank hosting it. Illumination: Saron marmoratus requires low illumination in the marine aquarium it inhabits. To host Saron Shrimp, you should have a reef type marine aquarium with a minimum water capacity of approximately ten Gallons to thirty Gallons. The aquarium should have ample corals, rocks and vegetation for Saron marmoratus to hide behind. Place Saron Shrimp at a low level in your tank. 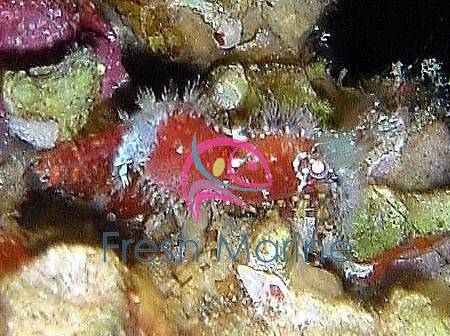 Keep Saron marmoratus in a small group in your marine aquarium. Saron Shrimp may take over three hours to acclimate to your marine aquarium. Once acclimatized to your marine aquarium environment, Saron marmoratus may come out during the day time as well. Feeding & Nutrition: Saron Shrimp is Carnivorous in feeding habit and eats brine shrimp, plankton, pellet, frozen meaty bits, flaked vegetables and fish. Saron Shrimp is easy to maintain owing to its non-poisonous nature. Copper and Nitrates in the water may prove lethal for Saron marmoratus therein. Maintain an ample quantity of Iodine in the reef aquarium water to facilitate the smooth molting of Saron Shrimp.